This post is about how we created our non-traditional wedding ceremony, when we didn’t really have a tradition that felt 100% right to us. There are aspects I might tweak if I had it to do over, but it married us, so it was perfect in its way. First of all, I’d like to clarify where we were coming from. We come from families with varying degrees of adherence to Catholic and Presbyterian faiths, but my husband and I are not religious. And by that I don’t mean, “well we’re sort of [insert denomination] but don’t go to church or anything.” We don’t believe in god, period. I don’t even like the words atheist or non-believer, because it makes me feel like I’m deficient in some way. But this is just to provide some context; nothing in what I’ve said or am about to say is intended to be any kind of judgment on those who do have faith and follow a religion, or have faith but don’t necessarily follow a religion, or don’t have faith but still plan to include biblical or other religious aspects in their ceremonies. Honestly we would not have gotten too far without our officiant. 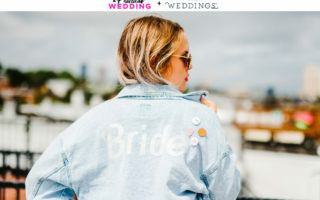 The internet is surprisingly unhelpful regarding ceremony structure and content, and I’ve gotten to the point where, if the internets can’t help me, I have no idea what to do (I’m gonna come out and admit that I wasn’t even fully aware that I could THINK for myself, before I came across APW). 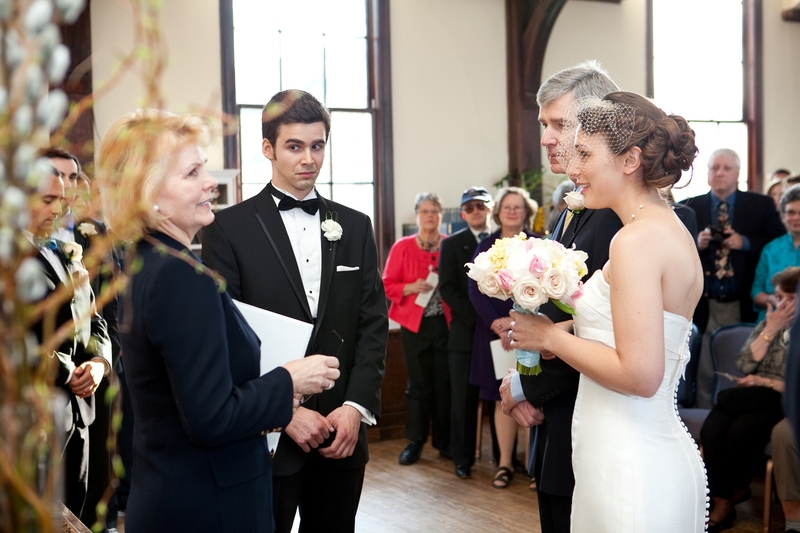 Luckily the internet did lead us to our officiant (thank you WeddingWire), and she helped us from there. In the interest of giving good advice, I would say you definitely want to shop around when you’re looking for a stranger to perform your wedding, and make sure they will take the time to get to know you. In the interest of full disclosure, I’ll tell you we spoke with two candidates, and the one we chose was based on a telephone conversation (we didn’t meet her in person until 2 weeks before the ceremony). We had a good feeling about her approach, and it worked out – but it was a bit of a gamble. Our officiant provided us with several different types of vows and ring exchange wording, and we pretty much picked from what she gave us, with a little tweaking. Then we added some additional vows that we would answer together (pledging to channel our loving feelings into our community rather than turn inward and isolate ourselves; to seek to understand ourselves, each other, and others in our life, and continually examine our own minds and approach life with curiosity and joy) – we were inspired by traditions that were not our own, but instead of adopting whole pieces, took the spirit behind certain traditions and incorporated them in a way that felt true for us. The structure was largely of Christian origin, some of the vows were inspired by a Buddhist wedding service, and we had our brief time alone directly after the ceremony, similar to the Jewish yichud. 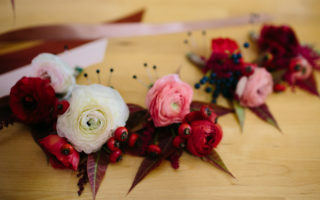 When you don’t feel an affinity to the traditions you grew up with (if you didn’t really grow up with any traditions that relate to weddings), it becomes a delicate process, building a ceremony that feels right to you and your partner, and feels familiar and relateable to your guests, but above all feels True and Honest. The best you can do is basically what Meg is advising all the time: Be Thoughtful. Also, remember Google is not your friend in this. Drawing from what you already know, have already read, have already experienced, will be way more personal than any internet search results. OH. And have fun with the music.